I can’t believe how much I’ve actually gotten done these past three weeks! It’s been a whirlwind around here, for sure. I bet you’re wondering, but no, Baby Girl has not yet made her appearance. I’m not due until this weekend, so fingers crossed she is on time! I’ve been busily scurrying around making food plans, unpacking the rest of the house and I even managed to (somehow) get some sewing done. I’m so pleased with how her mobile turned out! I mentioned I had it cut out in my last post, but I was a little bit nervous that it wasn’t really going to get done. After spending about three evenings on the couch with a needle and thread, and patiently painting a wooden embroidery hoop with a few coats of white paint, it was finished. It turned out just how I had hoped. And best of all, it was free (besides the spinning music box, which I bought on Etsy for $10). My friend Erica gave me all of the felt and sequins from her stash that I needed to make it. Of course, when I first started stitching, I wanted it done FAST and I was using a whip stitch on the felt. Umm… no, that was hideous. It look like a 5 year old’s first project. For some reason, I don’t like doing the blanket stitch. It’s always what looks best on felt, but for some reason I thought I could get away with something faster. Don’t be like me, or you’ll have to start over. The original inspiration mobile can be found here, at Milbot and Chooky. I would have loved to have purchased it from the maker, but it was out of my budget, plus I really wanted to make it myself. 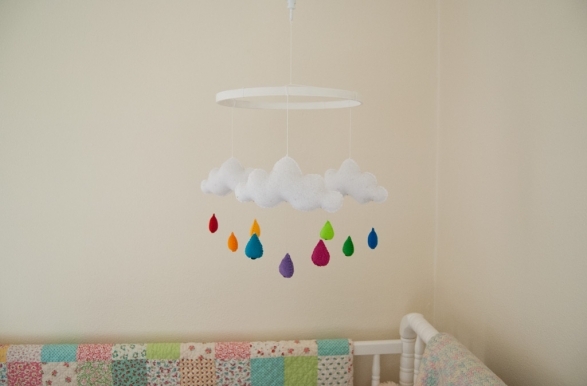 I added a few things to this mobile, like tiny clear and silver beads to the clouds. 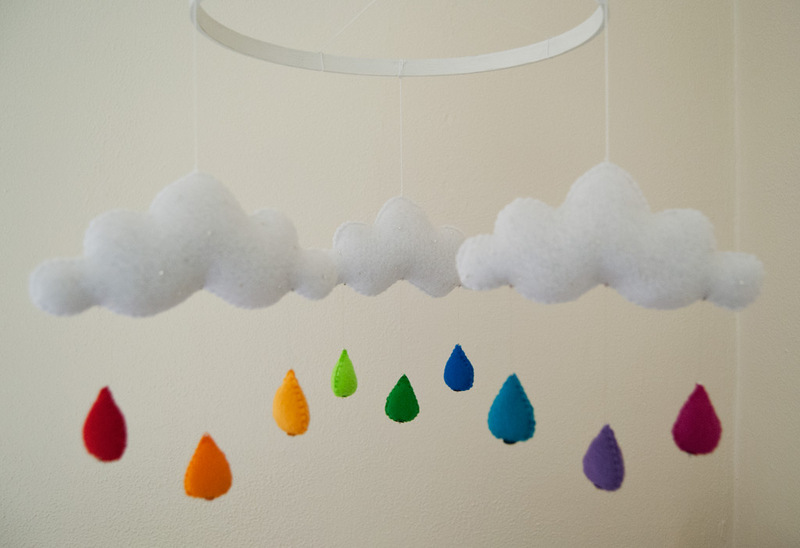 There is also a coordinating color sequin on the very bottom of each raindrop, to hopefully catch a little bit of light when it spins. Other things I’ve been making? Well, another Swedish Baby Nest! This one is a gift, that has been shipped to its new home. Jennie, my friend who originally sent me the pattern, had a lot of requests to make a PDF pattern available. I gave her my thoughts on the pattern, and she worked very hard to make and release it recently. You can find it in her Etsy shop, Jagged Rose. 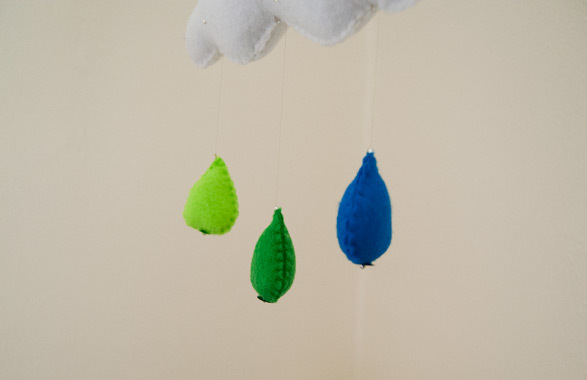 She also will be hosting a sew-along on her blog very soon, so if you have babies that need a cuddly place to sleep, pop on over to tell her hello! I am really pleased with my second baby nest. It turns out that on my first one, I had put on the bias tape incorrectly, which is why it was so hard for me to feed my drawstring into the casing. Following the directions helps a lot! 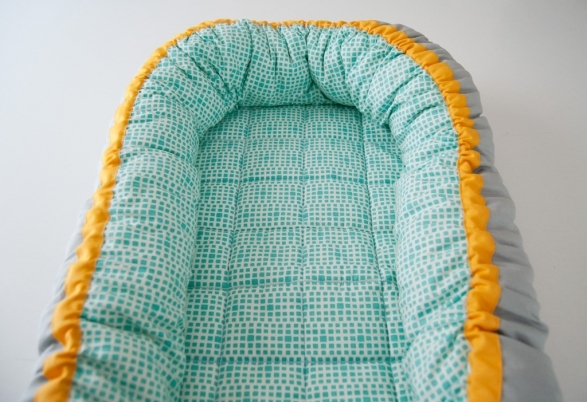 I still chose to quilt the bottom mattress with a grid of squares, and I made the sides more squishy by adding extra fiberfill to the rolled-up batting that you put in the bumper edge. 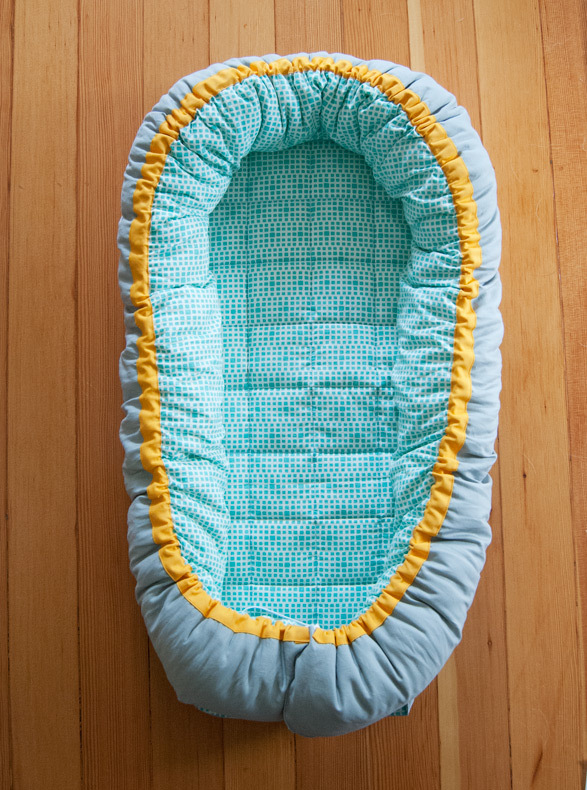 I can’t wait to see my friend’s baby all wrapped up and sleeping soundly in this! I described the nest to my Grandma, and she said, “That sounds lovely. Please make one for me in an adult version.” It’s tempting to do, for sure. While finishing unpacking the rest of my studio, I came across a few patterns that I had every intention of making during my pregnancy, and just never got to. 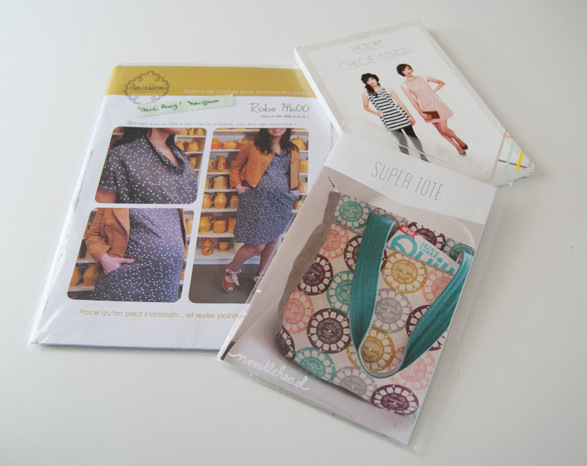 I thought that I would make this really awesome maternity wardrobe, that I would have completed some nursing tops by the time I was 9 months along, and of course I’d get that tote bag done that I wanted to use as a purse/diaper bag. HA. It didn’t happen. I even bought fabric for that Victory Pattern’s Chloe dress, and I ordered this super-fancy French maternity dress pattern online from Deuxieme Arrondissement. I had visions of making it out of a lovely drapey wool, or a soft chambray. Then we moved, I was exhausted, and I thought, “Why would I use up my energy and fabric stash to sew maternity clothes that I’ll only get to wear for a few weeks?” The dress is still really tempting because it looks super easy to make, but I also would love to save the fabric to make a Grainline Alder with sleeves. I tell you, Jen’s patterns have been driving me nuts. I just want to make and wear them, but this giant belly is kind of getting in the way of those plans. Maybe I’ll get to the Super Tote soon, but I’m not holding my breath. The reality is that I’m about to have a very tiny person to answer to, who I kind of doubt cares about my sewing time. I’ll take it though. 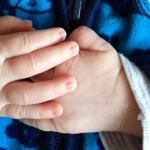 Sniff a sweet newborn head or spend an evening tracing out a pattern? That’s no contest in my book! This entry was posted in Life, Projects and tagged baby, color, sewing on November 5, 2014 by Amy Alan. the mobile is adorable!!! so excited for you to meet your baby girl soon 🙂 .. and i agree, she will be loads of fun and keep you busy, but i’m sure you’ll sneak in some sewing somehow 🙂 …. Thank you, Robin! I am anxiously awaiting her arrival- and getting impatient! 🙂 I’m glad that tiny baby clothes are quick to sew, so that hopefully that will keep me satisfied with feeling like I’ve accomplished a project or two during the first few challenging months. Thanks, Jennie! I’m pretty happy with it. Haha- yes, one project at a time! It’s so hard not to make lots of things for babies though. It’s all so fun and colorful! And you’re welcome! I hope lots of people make your nest pattern. I’m so excited to use it! Good wishes for an easy delivery and I’m beyond excited to see pics of the new arrival! Thank you, Angie! 🙂 I am also really excited to meet her! Fingers crossed that she has lots of dark hair like I did. 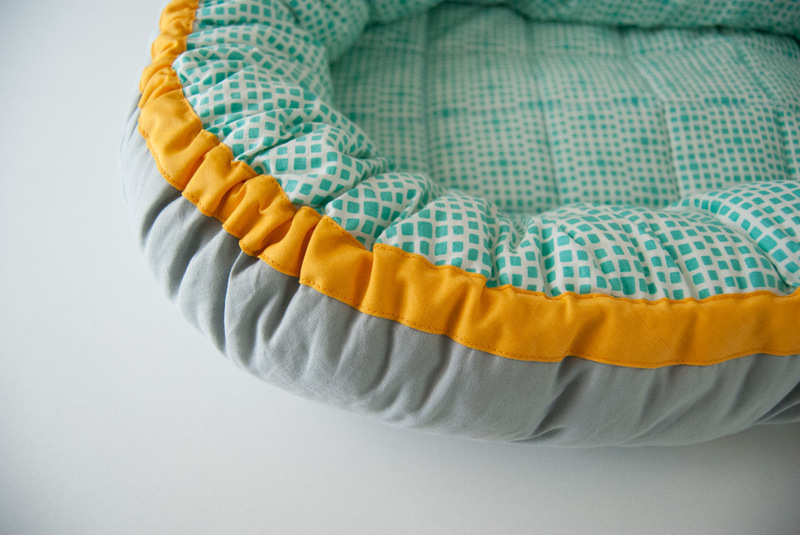 Colic….the reason to sew! no joke. just trying to help you postpartum. Fact is, I was very much a CRY BABY . My mother was at her wits end when she discovered the sound of the VACUUM CLEANER soothed me! So if your sweet angel has colic, you may do well to SEW AWAY (although Bernina’s are not very noisy :/) while she NESTS nearby. Yes, I don’t think my machine would be loud enough to act as a sound machine (we do have one of those, just in case). Fingers crossed she isn’t colicky and she enjoys the sound of the sewing machine. She’s heard it enough already that she might like it! Ahhhh, that mobile is so sweet! And the baby nest… well, add me to the list with your grandma. Adult nests for everyone! 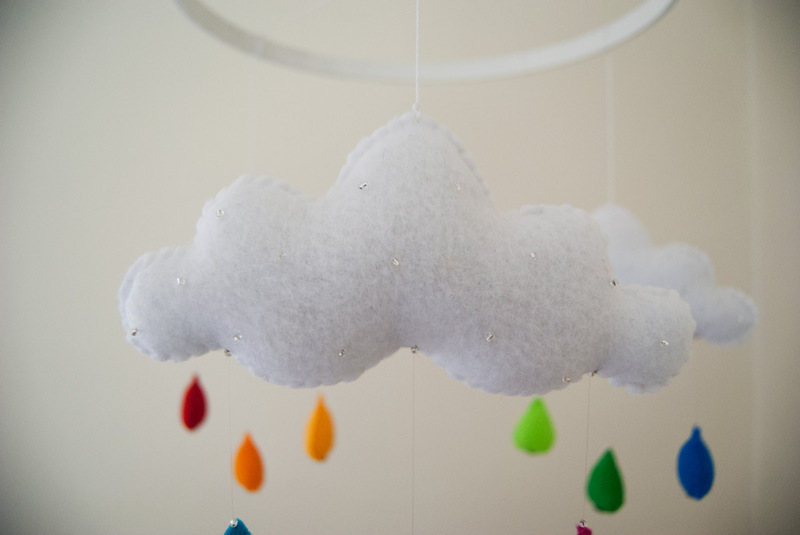 I’m glad that’s a pattern now because I need to make some baby gifts and this will be just the thing! I love the mobile! It’s perfect. As for the dress, alter the pattern to make it for after the baby. 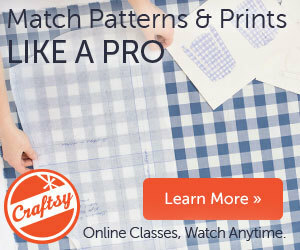 I am glad to hear that I’m not the only one that has unfulfilled “sewing hopes”! 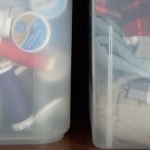 That’s why my sewing room is such a disaster! Thanks! I’m really happy with how the mobile turned out. I could alter the pattern, but I’m not sure that I’ll have time, seeing as how the baby was born November 11th and I’ve hardly even stepped into my sewing room! Thank you! I would love to post about the baby soon, but I’ve got my hands quite full! 😉 It’s on my list of “things to attempt to do sooner than later”, haha! I’m so glad you’ve learned so much about your serger thru my class! That’s great to hear. The fabric is from Cotton & Steel’s first fabric line. You can probably still find it online if you look for it. I don’t remember the print name, but I’m sure it won’t be hard to find!